EDIT: I JUST RECEIVED THE ABSOLUTE BEST BIRTHDAY GIFT EVER - A CLEAR PET SCAN! PRAISE GOD, MY HEALER, MY PORTION! Today is my 27th birthday. I'm getting old. You know by now that I'm a highly reflective person. I don't know that I've always been this way, or if my life's path has forced me into reflection, but birthdays definitely bring about a certain element of pause for me. I can think back to all of my past birthdays, and several significant ones stand out in my mind. When I was five, we had my birthday at McDonalds. I think that was a pretty popular thing back in the day. In fact, this was back when they had the McDonalds characters available for parties. I remember that little, blue, fuzzy guy was at mine. After devouring our Happy Meals, my friends and I tirelessly played on the merry-go-round and other old school playground equipment. When it was time for presents, I was so eager to learn whether or not I'd be receiving the real baby stroller that I had been dreaming about. Finally, my eyes stopped on an oddly-shaped package. I quickly tore off the paper, and saw, none other than, a stroller for real babies. I think my heart skipped a few beats in that moment of pure joy. Finally, I, in all of my five-year-old glory, had arrived. I wonder what my response would've been if I had received something different. Would I have liked it more? Would I try to disguise my disappointment? Who knows! Matthew 7:9-11 says, 9"Which of you, if his son asks for bread, will give him a stone? 10Or if he asks for a fish, will give him a snake? 11If you, then, though you are evil, know how to give good gifts to your children, how much more will your Father in heaven give good gifts to those who ask him!" I love the picture that this scripture gives. It illustrates so clearly the truth behind my birthday gift. My parents knew that I would love a baby stroller. I had begged them for it! Throughout my life, they have lavished me with excellent gifts. This has helped me understand that my Heavenly Father is capable to give even greater gifts, if only I ask. Some people seem to have trouble with this idea. To me, this doesn't mean that I can pray for a red Mercedes, and then one will just magically appear in my driveway. A person who is actively seeking to know and understand the Lord, will desire things of the Lord. Therefore, our prayers will reflect that. For instance, the prayer of this person might be, "Father, thank you for hearing my requests. Please provide a way for me to get to work. I understand that all I have is yours, and I'm only a steward of your wealth. Make me a worthy steward." Do you see the difference? In the second example, a heart of yieldedness to God's best is present. The Lord might provide a red Mercedes, but He might provide something even greater - a red lamborghini. Friends, I am doing my very best to live in this sort of submission to the spirit. Honestly, the older I get, the more I realize that it's the only way to live abundantly. I'm a firm believer in praying specifically, so that I know when prayers are answered. However, I also see the need to allow God to work freely in my life. I don't want to limit His work with my own stupidity. Let's boldly submit our wills to God's control - starting today, right now! When you walk in the backdoor of our house, there is a useless little space of nothingness. It's open to the laundry room, but there are no shelves or cabinets or anything of any productivity. I'm not sure what color the walls look in this picture, but they were gold. It wasn't altogether revolting, but it was kind of a stressful color, and I like to see calm colors when I first get home. This may seem silly, but it's just the way that I feel. Anyway, after some painting and assembling and installing (Brian, I'm so glad that you are so handy around the house. There is absolutely nothing that you can't create or repair. ), we created this little area. Our general rule of thumb is that I install something poorly, and then he comes behind me to install it correctly, once my attempt fails. It allows us to both feel useful, I guess. Sorry for the pixelated picture. I know how to fix it, but I'm just too lazy to do it. Does that say something negative about my character? I sure hope not! A close-up shot to show more detail. We are keeping shoes, umbrellas, etc in those baskets. Not all shoes, but the ones that we regularly put on to run outside. We go outside a lot. Before, there was always a collection on the floor that was forever in the way. I am planning to label the boxes with categories: work, home, medical, bills. I thought about doing a whole, big, organized filing system, but then I decided I didn't want to feel like a secretary when I'm at home. I just need some system to manage paper. I hate the constant influx of paper. Okay, this one is taken from the garage door. It gives you some perspective about how silly this room truly is/was. On the right, we hung a bulletin board and dry erase board. It's very cool. It's almost the same color as the wall. 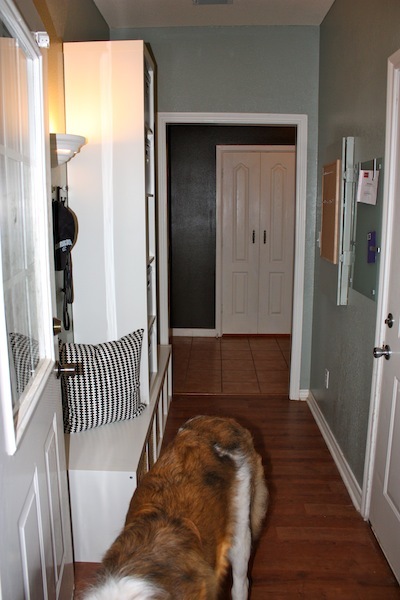 The dark wall that is straight ahead is the laundry room, and those double doors are the pantry. To the left is the 1/2 bath, and to the right is the kitchen. I wish you could all just come over so you could help me think about how to put this house together. Oh, and that's Wally's backside. It's near impossible to get a dogless picture at my house. Have a great Fathers' Day weekend! Your new space looks awesome!! You two did a great job of changing it. I would LOVE to see your home, it looks so lovely! Hope your day is special, just like you! Happy birthday, friend! The hallway looks great. Quite creative. Just saw your update on the clean PET scan!! I emailed you personally earlier today b-day greetings. Wow - that news is so awesome - Praise God from whom all blessing flow! Happy Birthday and so happy for your news! And love the color on the walls of your little room! God is so good! I'm thanking Him right now for the excellent news! You and Brian are so creative. I love the new space. Isn't it fun when an idea comes to fruition? On a much smaller scale that happened to me when making a Father's Day card for my husband. The photo that I chose to go with this particular template was perfect. Have a wonderful birthday weekend basking in the kindness of our Lord and Savior. Happy birthday! You share your birthday with my wonderful husband. Enjoy it! OH MY GOODNESS! I love your writing by could not even finish reading the post after the I read the news of the PET scan. Crying tears of joy for you and thankful for your example of boldy petitioning the Lord and claiming his promises for your life (and allowing us to do so with you). Congratulations to you! I know you guys are going to have an awesome weekend of celebrating! What a wonderful gift of good news! Congrats and Happy Birthday. Congratulations and Happy Birthday! Also, I had my 5th or 6th b-day at McDonalds. Kids now would probably think it was so weird. Another also, I totally get what you're saying about God and His gifts. Obviously He often blesses us with great physical gifts, but God is not a genie who grants wishes. His gifts are so far beyond just physical things. He gives us joy, peace, and salvation. Finally, your room looks really cute. 1. AWESOME news!! What a great thing to hear on your birthday! 2. I did a McD's birthday party too. It was "the thing" back then! 3. 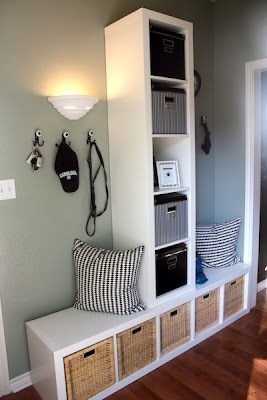 I love your mud room! 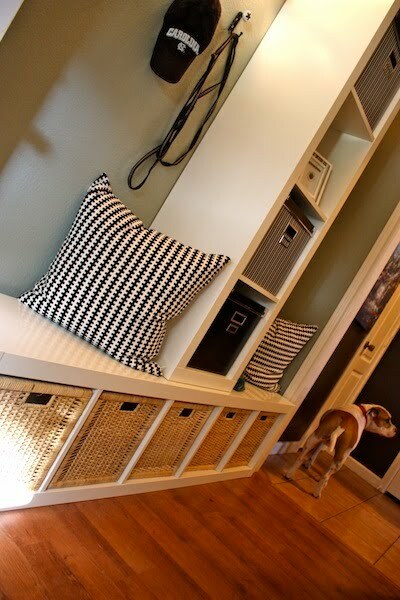 I love built-ins and your room screams HGTV to me! Perfect!! Rejoicing with you! Hope you have a wonderful birthday! Happy birthday! And thanking the Lord for your test results! Hope you have a great weekend! HAPPY BIRTHDAY LINDSEY!! Our prayers are being answered. I pray everyday for your healing. It's so exciting to hear of your clear pet scan. Have fun this evening when you and Brian go out to eat, celebrating Dale's Birthday as well. Happy Birthday, Hallelujah! and Amen!! I was just making my rounds and catching up on blogs and just read your news.... FANTASTIC! I'm just thrilled. So thrilled. It makes my whole day. May God continue to bless you!